Police Chief Danielle Outlaw promised a fair and thorough investigation into the officer-involved shooting of Patrick Kimmon at the Friday meeting of the Community Peace Collaborative. "We have to hold ourselves accountable if we screw up," said Outlaw. Kimmons, 27, was shot and killed by officers responding to a shooting in downtown Portland early Sunday. Two other men who have not yet been identified were shot and wounded before the officers reached the scene. African-American community members and police officers at the forum both expressed anguish over Kimmons' death. They included a girlfriend who is the mother of two of his children, along with a Gang Enforcement Team officer who said he had many positive interactions with him over the years. 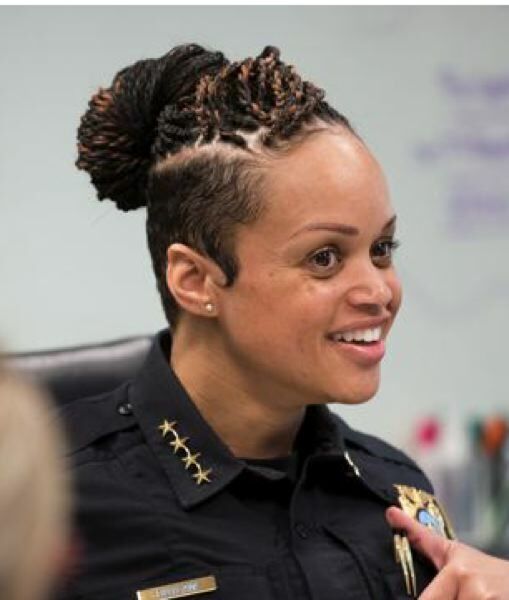 Outlaw spoke bluntly about her challenges as an African-American law enforcemement officer, calling herslef and the other African-Americans in the room "black people." She acknowledged the raw emotions in the room, and said she herself struggles with how to respond when community members are killed. She also talked about growing up in Oakland, where she served as deputy police chief before being hired by Mayor Ted Wheeler, and said many of her friends had died there. And Outlaw said she is the mother of two boys, one 17 and the other 20, who are just now moving to Portland. "I am a mother first," she said, explaining she cannot imagine the grief that Kimmons' family is going through. The forums are held every other Friday in the community room at North Precinct. The focus is on ways to reduce youth violence. They are traditionally attended by social service workers, law enforcement officials and community members. The officers involved in the shooting are on paid administrative leave, as per bureau policy. They are identifed as Sergeant Garry Britt, a ten-year veteran of the Portland Police Bureau, and Officer Jeffrey Livingston, a year-and-a-half-year veteran. The incident is being investigated by the police and the information it produces will be given to the Multnomah County District Attorney, who will present it to a grand jury. The process is expected to take several weeks. Some at the forum were upset that news reports of the shooting identified Kimmons as a gang member with several convictions who was wounded in a gang-related shooting in 2014. Several of those who knew him said he was working hard to turn his life around, but that it is a difficult process . You can read a previous Portland Tribune story on the officer-involved shooting at tinyurl.com/yd55of6n.